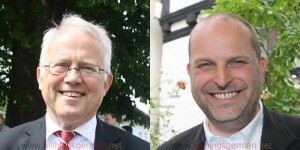 A couple of weeks ago I asked for questions from EU nationals living in Oberursel to put to the candidates for the Mayoral election. I have now interviewed both candidates and will be publishing one question each day this week with their answers. Question: I found out that the Ausländerbeirat existed through the blog “AllThingsGerman”. When I arrived in Oberursel and went to register, no-one told me about this committee or that there office to offer support. What do you think about holding welcome meetings for new residents to tell them about the schools, taxes, and everyday life in the town? e.g. every two months? I answered myself that there are already tours for new residents, a brochure for new residents and even a flyer in foreign languages. So what, I asked, about the idea of welcome meetings? It also seems that the present information is not reaching people. The town already has a welcome brochure in two languages. But I think it is a good idea. We have already done similar things in the past to welcome new residents. But with the number of different languages it is not always easy to do. Perhaps the meetings should be split by language to make it easier to direct communication easier. But in my view it is a good tip, not just to talk about those topics, but to present the town as a whole, with the possibilities it offers and its organisations. Tappenden: Is it something that you would implement? Brum: Yes. The town was recently given an award for its welcome culture, because it is an attractive location for foreign residents. I think this would be a good improvement. I think the idea is good in principle. We are talking about new residents with a migration background, whose addresses the town could collect and then invite to welcome meetings at regular intervals. There they could receive basic information and also the Ausländerbeirat (Foreigners’ Advisory Council) could present themselves. I could envisage there being “pilots” for new residents with a migration background, who then help them when have to visit official institutions. When someone arrives in Germany from another country, they are confronted by a new culture and a new society, that they are not used to from their home. When they have to go to an office such as the town’s administration, and have to complete a number of things there, they would have help. We could involve the “Ehrenamtsagentur” (volunteers’ agency) in this, because the number of positions in the administration itself is of course limited. There are a lot of people who can speak English or French, but with other languages it is more difficult. It would be an fascinating question, whether the agency can find a pool of people to help the new residents with migration background. Another aspect for integration are the clubs and societies. I am myself the chairman of the joint clubs and societies committee in Weißkirchzen. We have just brought out a brochure for people who register in Weißkirchen, in which the clubs present themselves, so that those who want to sing or play sports know who to contact. Until now that has only been in German. Perhaps something like that could be done for the new residents with migration backgrounds. One should explain how social live in Germany works, the role of the town’s committees and who takes which decisions. The role of the Ausländerbeirat could also be explained and how to get in contact with them.